I'm frustrated enough to move my dad (89) to a nursing home. He ignores us when it suits him but hears just fine when we ask about something he's interested in. He says, "I didn't hear you," but we know he's just practicing selective listening! What do you think? We think you both may have hearing issues. Read on. Mom's lost interest in her grandkids and us. At 82, she knits beautifully, bakes delicious pies for church, reads constantly, but she never calls us anymore and doesn't return our calls. When we talk about our kids she just looks bored. Is she trying to tell us something? I ask a question, dad answers with a completely different subject. I ask, "Why do you keep changing the subject?" He looks at me like I'm from Mars and the battle begins. We get angry, stop talking almost entirely, and begin the whole process again later. Help! Although about 1/3 of Americans aged 65-74 and 1/2 of those over 85 have hearing problems, many refuse to acknowledge them. 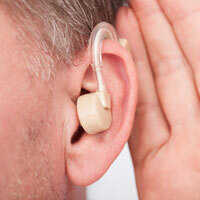 Hearing loss isn't always an "all or nothing" condition. Some people may miss certain sounds or hear part of a conversation, others hear distorted sounds that render the whole conversation jumbled or meaningless, some hear nothing at all. Untreated or unaided, this loss can mean withdrawal from conversations and social engagements with friends and family, an inaccurate diagnosis of dementia, as well as significant danger because the person cannot hear fire alarms, doorbells or communicate with a 911 operator. Family physicians don't always test for hearing if the loss isn't obvious and the quiet setting of an examination room often makes it easier for the patient to hear the doctor. Your first step is an appointment for your parent with a Board Certified Audiologist or Otolaryngologist (Ear, Nose & Throat Physician) for a complete hearing loss evaluation and treatment plan.